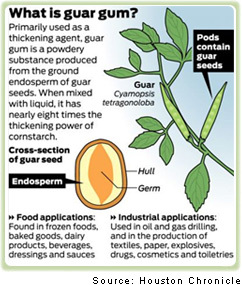 Guar gum comes from the endosperm of the seed of the legume plant Cyamopsis Tetragonoloba, an annual plant, grown in dry regions of South-east Asia. There are various grades of Guar gums pure or derivative. Guar gum is a white to creamy colored, free flowing powder and free from extraneous matter. Its ability to suspend solids, bind water by hydrogen bonding, control the viscosity of aqueous solutions, form strong tough films have accounted for its rapid growth and use in various industries. For example guar gum is used in paper, textile, oil drilling, mining, explosives, ore flotation and other various industrial applications. Guar Gum powder is soluble in hot & cold water possessing strong hydrogen bonding properties. It is an excellent thickening, Emulsion, Stabilizing and film forming agent. Being non-ionic in nature it maintains a constant high viscosity over a broad range of pH. It is known for its high solubility and the viscosity of Guar gum solution increase gradually with increasing concentration of Guar gum in water, however it is influenced by the temperature, pH, presence of salts and other solids. It has a unique ability to control rheology by economic water phase management. It forms highly viscous colloidal dispersions when hydrated in cold water. The time required for complete hydration in water and to achieve maximum viscosities depends on various factors such as pH, temperature, grade/mesh of powder used etc.